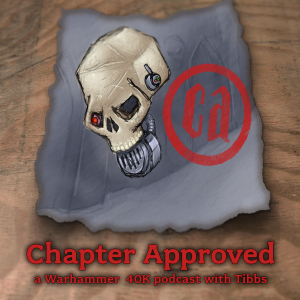 Tibbs has a Warhammer 40K podcast? Remember that one time I mentioned that I was working on a something new? I’d forgive you if you forget since it was a while ago, but I’ve been plugging away behind the scenes. Last week I finally launched Chapter Approved with three episodes ready to roll, so you can get a taste of it right off the bat. The basic idea here is to talk about some topics from the perspective of a ‘casual’ gamer, as opposed to the super-competitive stuff you often hear about. There are tons of podcasts that already do that very well, and even the more well-rounded ones spend more time than I would like talking about tactics and whatnot. It’s fine, but I was looking for something very short that just covered the more fun or hobby-related aspects of Warhammer 40K. So where do we find this podcast? That’s the easy part. I did my best to publish it basically everywhere. I’ll make a list below of the most popular spots, plus the RSS feed link so you can add it to almost any app. 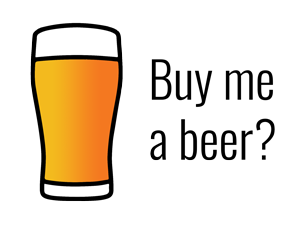 If you prefer to just sample it, you can simply visit the website to listen to a stream and download the episodes for later. I could use your help to get the word out. Here’s where you come in, loyal fans. I need two things from you if you have a moment to spare. Exposure, and feedback. In order to be discovered by new listeners, I need ratings and reviews in the various apps. iTunes is the big one, because if the show gets enough reviews it’s possible to land in the New and Noteworthy section. 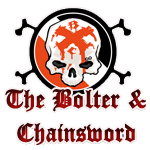 Please take a listen and, if you like it, spend just a moment to drop a star review or do a quick writeup. The second thing I need is lots of feedback. I know there are a ton of podcast options out there. What will make this one worth listening to? I like the short format, myself, but what sort of topics do you want to hear about? If you have a suggestion for someone to interview, a product to review, etc. please let me know. I’m wide open to ideas, but my main focus is making something for the average gamer. Inspiration, tips, and showcases of armies or projects that are really special, even if you never see them at a tournament or in a painting competition.